Fine artist Paul James is a remarkable and fascinating man. He is a gifted wildlife, animal and landscape artist and an amazing composer and pianist. It would seem that if he has set his heart on learning something he goes for it big time. In fact should you make reference to his talents Paul will argue that his creative abilities are not down so much to talent but more about his attitude and application to his craft; he certainly demonstrates a dogged determination to succeed in everything he does and he admits a desire for recognition and respect as an artist. Currently resident in Southern Ireland, he was born and grew up in Leicestershire, England. His artistic and musical abilities became apparent from a relatively early age and with the support and encouragement of his parents he is essentially self taught. He did go to Art College at the insistence of his teachers to study graphic design, but being something of a rebel he did not wish to conform to the course requirements so left and began to make something of a living painting classic cars and commissions of neighbours pet dogs and cats. Paul then went on to develop a career in music playing both organ and piano in a range of pubs clubs and cocktail bars. However, it did not quite live up to the rock star lifestyle that he had envisaged so he returned to his art and began painting professionally in 1986. It was the haunting beauty of the nearby Charnwood Forest that greatly influenced his early atmospheric landscape and animal paintings for which he has become renowned. Paul has perfected a style with incredible fine detail, which means that his works take time. 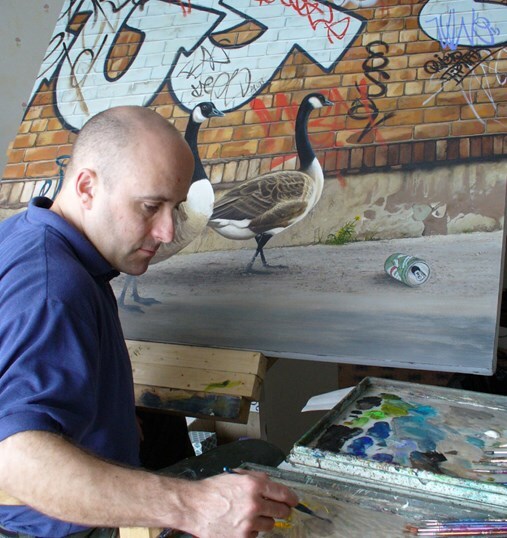 He paints in acrylics either on canvas or board and uses his own photographic reference material. Over the years he has had a number of publishing deals with the likes of Verkereke, Gordon Frazer, Solomon & Whitehead, Washington Green and Blazing editions, however in more recent times he has decided to take control and self publish with the help of his wife Linda. For six years they had what many would see as an enviable lifestyle as they lived and worked on board their narrow boat ‘Fool’s Paradise?’ and travelled around the inland waterways of Britain where Paul gained inspiration for many of his paintings. Whilst Paul spent much of each day painting, Linda would ‘set up the stall’ and sell items directly off the boat to people walking along the towpaths and fellow boaters. Occasionally they would attend waterways festivals and shows and would put on quite a display hanging pictures (weather permitting) the entire length of the boat. They also spent time introducing Paul’s work to shops in the various villages and towns that they travelled through. The original idea had been to lead an alternative stress-free existence away from the ‘rat-race’, however as business grew things started to get a little out of hand. The boat gradually filled up with various items of stock including canvases, frames, prints, cards, envelopes and display items and it was not long before they decided that they needed more space to live and work in. This is why early in 2004 they took up residence in the ruralness of Southern Ireland. Surrounded by the wildlife, flora and fauna that inspire his work and with the peace and tranquillity that the countryside offers Paul has a much larger studio to work from. In addition to being a superb fine artist Paul is also an accomplished composer and pianist. He has a particular penchant for the blues, boogie woogie and jazz. During the last few years he has spent more time composing and playing the piano with the intention of bringing his creative skills together. To this end he became involved with Scottish based music management and production company Divamusic who held an extremely successful event ‘An audience with Paul James’ at the Harbour Arts festival in Irvine Scotland at the back end of 2006. The event involved an exhibition of Paul’s paintings together with a solo piano recital and talk by Paul about his life, music and art. He was joined by singer Katrina Fitzsimmons and some musicians, including Scotland’s leading trumpet player Ryan Quigley and jazz saxophonist legend Bobbie Wellins for part of the show. Diva music has since produced Paul’s first music album ‘From Palette to Piano’ and a promo DVD of the ‘An Audience with Paul James’ event. Since his move to Ireland Paul has developed a wealth of new contacts and his works are now available through a range of galleries across the country both North & South. He has also participated in a number of events including the famous Wexford Opera Festival - Art Fringe event, he had a combined concert and exhibition at Johnstown Castle also in Wexford and he played piano at the popular Bewley’s café theatre bar in Dublin. Over the last few years Paul has also taken time to explore the American Art Market. During 2005 he and Linda made an epic trip across 31 of the American States promoting his art and music. During this journey they met up with Mike & April Johnson owners of Texas Art Depot in Palestine who were already selling some of his prints. At their initial meeting Paul asked if they knew anyone who kept "Texas Long Horn Cattle" as he wanted to photograph some for future paintings. It just so happened that one of Mike's friends within the oil business had a steer "Bevo" as a pet. He in turn said that he was drilling a well close to a ranch in Midway Texas that raised Texas Long Horns and he would arrange for them all to visit. The ranch owners Rex & Vicki Mosser were wonderful hosts; Paul & Mike were provided with an ATV each to tour the ranch whilst Linda travelled with Rex in his four seater along with food for the cattle. Both Paul & Mike took literally hundreds of photographs of some of the worlds champion long horn bulls, steers and cows. Following this introduction to Texas Mike and April asked if Paul would like to hold an exhibition with them the next time he visited. This he duly did along with his original painting of "Marshall Lee" (one of Rex's bulls) aptly on display. At the show Paul & Linda were introduced to other Texas ranch owners who invited them to meet with their champion longhorns. Paul now has a huge collection of photographic reference material to draw from and he has since painted another piece "Golden Girl". Both of these paintings have now been sold by Texas Art Depot. During the later part of 2006 and the early part of 2007 Paul & Linda took six months out to do more travelling in America and then they went on to explore Hawaii, Pago Pago (In the American Samoa's) Australia & New Zealand. As they do not enjoy flying they sailed across the Atlantic and the Pacific Oceans onboard the Queen Mary 2 which if anyone gets the opportunity they heartily recommend. They feel that it is a much more civilised way of travelling and it gave them the opportunity to meet lots of people some of whom have become life-long friends. Already several of his recent paintings were inspired from his trip to the Southern Hemisphere including ’Dave’ and ‘Paris & Nicole’ who were found in New Zealand. The pelican in ‘Zebra Crossing’ was discovered on the beaches of Terrigal just North of Sydney and ‘Rod’ his spoonbill was also found in Australia. Other pieces will undoubtedly materialise over time. Paul's work is increasingly attracting more attention and he has had a number of successes with paintings receiving awards at a number of exhibitions around the UK. (Finalist (last 20) in Not The Turner 2003 for "Camilla" Finalist in Not the Turner 2004 with "Road to Morella"," The Addenda Award" at Royal Birmingham Society of Artists Prize Exhibition June 2004 for "The Return" and "The Retreat" and the "Viewer's Favourite Award" at the Royal West of England Academy Autumn Exhibition 2004 for "The Retreat". Runner up Editor's Professional Collection - Wildlife Artist of the year 2005 with Wildscape Magazine with "Jarvis" and he was nominated as a Finalist in the Up and Coming Published Artist Award with the Fine Art Trade Guild 2005. In 2006 he was awarded Signature Membership of "The Society of Animal Artists" in New York. Although Paul has been painting professionally for over 25 years he feels that he is really only just beginning; he has so many ideas for new paintings and he has a desire to paint animals and landscapes from around the world.